Never a dull moment in digital marketing news! This week our pop starlet overlord showed us just how to own the entire Internet. Meanwhile a bunch of climbers scaled a rock face so that you can look at pretty pictures of it from the luxury and safety of your home. Take a look before breaking free of your workplace trappings; this is our Weekly Wins. This week Taylor Swift posted an open letter to Apple. The sweetly posed diatribe stated Swift’s displeasure at learning that during the three-month trial period of Apple Music, the service would be withholding royalties from the artists being streamed. So Swift hopped on her soapbox, in a manner that is not unlike the type of digital rant that can be seen daily from average anybodies on social media channels. The only difference is that in this case the soapbox ranter happened to be T Swift, a person with a combined social media fan base that rivals the population of a large country, so Apple listened. Or rather, they had no choice to. If they ignored her, the potential social media firestorm that Swift is able to generate would have been a PR disaster. Meanwhile, Swift’s critics unearthed how she treats photographers. Both incidents are an amazing showcase of the level of clout and stakes that a high-level social media influencer can wield. What cause will she take on next? If her army of digital denizens fall in line and echo her sentiments, the resulting tidal wave of opinion could sway any giant’s policies. These are not the complaints of a spoiled, petulant child. These are the echoed sentiments of every artist, writer and producer in my social circles who are afraid to speak up publicly because we admire and respect Apple so much. There is no apparently no limit to the reach of the Google Street View team. This week Google announced that with the help of some tenacious climbers they had effectively added street view images of El Capitan, the famous rock face at Yosemite National Park. This is our newest favourite Street View after Marseille Night Walk. Undoubtedly, the tourism industry is drooling over possibilities. Street View to this point has been perfect for checking out the house that you’re thinking of Airbnb’ing or renting for a while, but it hasn’t been able to point you to the far corners of this planet. It will be interesting to see if visits to El Capitan spike as a result. Next up: a random park in Brandon, Manitoba. Prepare yourselves, citizens of Brandon, the droves are coming. Just joking. That would be cool though. In a world of constant entertainment inundation, Google Music wants to take the work out of the user experience. The data driven service aims to curate the perfect playlist for you depending on your circumstances and the time of day. In the music service game your playlist will be compiled by either a robot that’s catering to you, a human that you’ve likely never met, or, least likely these days, you. And here’s the best part: Google Music is offering you this for the low, low price of free. Sure, you have to hear some ads but you can leave your credit card in your wallet. But would Taylor Swift approve? The artists will be receiving royalties for the play, so the benevolent Queen of the Internet should be appeased. 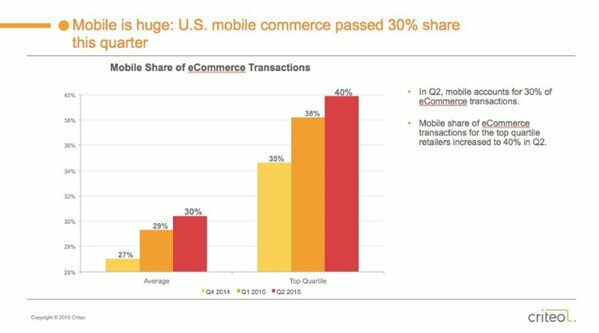 Stat Nerd: mCommerce has hit 30% of all transactions in the US. As mobile tech use continues to be more the norm than an exception to the rule, it only makes sense that savvy businesses would try to push conversions through your phone. And why not? Mobile purchases already account for one in three purchases that are currently made on mobile, with no end to growth in sight. A new report on mobile commerce from Criteo points out, that the technology is there to make buying the easiest thing that you do all day. With simple credit card integration through you cell phone, the buy button is all that you need to hit to have goods shipped your way, and everyone is trying to replicate the awesome success of P2P services like Airbnb and Uber. In an era where you would be hard pressed to find a grandma that doesn’t own a cell phone, you would have to wonder why any brand would choose not to exploit the selling power of mobile commerce. Perpetually in beta social media channel, Ello may have finally stumbled into relevancy. Though it is still not available to the public, it boasts thousands of ‘test users’ of the service reportedly comprised of an impressive bunch of celebrities, artists and chefs that have made the content on it a viewing pleasure. One feature that could set it apart from its peers is rumblings about an organic e-commerce capability being added to the mix. When it finally goes live, will marketers and brands rush in and exploit this peaceful social utopia? Probably, but in the utopian vision of the Ello marketplace as it currently stands, it should be like an interactive Kijiji, or a digital community yard sale. So get crafting. Ello’s on its way and the homemade jewellery and refurbished furniture that you’ve put so much time in to isn’t going to sell itself. Thanks for reading! It’s Friday, now go out and enjoy the weekend, you rockstar, you.